“Now they’re copying us to build up a wall. It’s like after climbing over the wall, we then bump into another one. It’s crazy!! (現在等於他們自己也照著我們這樣造個牆，於是我們以後翻牆出去，又被他們的牆牆住[，]這簡直瘋了嗎！)” On China's Sina Weibo microblogging service a Chinese Internet user with nickname “gap foreseeable (落差可見)” expresses concern over the Stop Online Piracy Act (SOPA), which expected to brought to a vote in U.S. House of Representatives before the end of the year. The Chinese government has long been criticized by Americans for obstructing the free flow of information through a filtering system popularly known as the Great Firewall. 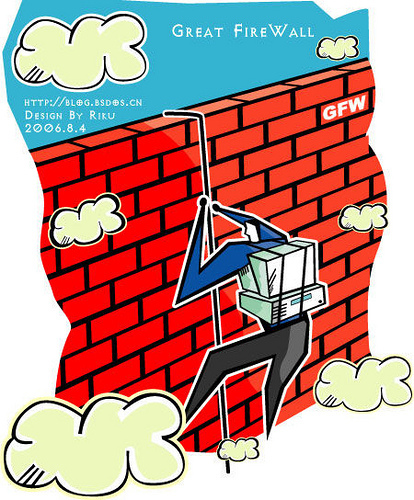 Now it is Chinese neitzens’ turn to sneer at proposals for a Made-in-America Great Firewall. The Taiwanese media company Next media Animation has even made an animated clip about SOPA, in which black-suited Hollywood businessman battle Internet company guys who are backed up by net users. SOPA is personified with cops using pepper spray against people who might use pirated works. The comments from China weibo users are even more bitter, and scorning –both at the United States and Chinese government. Aside from those sarcastic comments, Chinese blogger Michael Anti sees the introduction of SOPA into legislation as a conflict between opposing interests among rival groups. Anti also predicts that there is slim possibility for the bill to become law. However, “the introduction of the bill does also stage a grand legislation war,” Anti concludes.